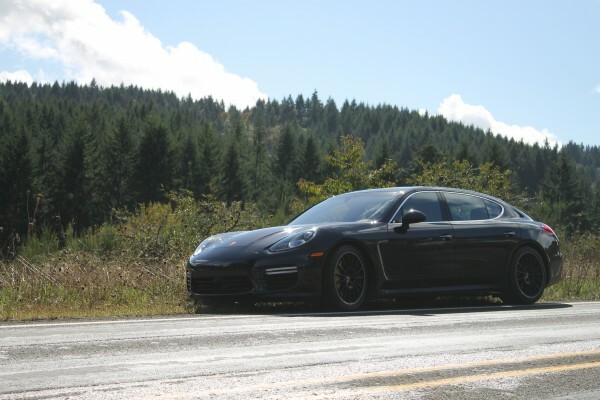 To truly review this Panamera they way it was meant to be used would require a chauffer. As Porsche didn't offer one up I took myself for a drive and promptly got lost, intentionally. I ended up nearly an hour away from where I was supposed to be. This was through no fault of the navigation system, as I didn't use it. The secret is that this car was so intoxicating, so fun to drive, that I simply didn't want to give it back. Sure it would be great to get chauffeured around in, but it's a Porsche and despite its size and heft is an excellent driver's car, as well. The nearest thing I can equate it to is, perhaps, a rocket sled. A supercar that seats four in extraordinary comfort, this is the Panamera Turbo Executive. I have never met a car with more contradictions. It weighs more than two tons, but it can sprint to sixty in 3.8 seconds. It has 520 horsepower on tap, but it can manage 24 miles to the gallon on the highway. It has a top speed of 190 miles per hour, but it has an extra 5.9 inches stuck in the wheelbase for added rear seat legroom. This car doesn't make any sense, but then again, the best ones never do. They say that everything is bigger in Texas, but I'm inclined to believe that statement will soon be directed toward China. The Executive model, while not expressly mentioned, has been crafted almost entirely for the Chinese market. China loves their cars to be "long wheelbase" versions, and if you are a luxury car manufacturer selling cars in China, you'd better get a long wheelbase sedan prepared ASAP. Even Volkswagen has introduced a longer Passat. If you ever do decide to step out of the driver's seat, however, the back is a glorious place to be. With the wheelbase stretched 5.9 inches (mostly for leg room, but also to facilitate rear seat power recline), ingress and egress are much improved, especially for people over 6 feet. In the standard Panamera, I found myself having to crunch into a little ball to get into the back seat. Once there, I was comfortable, but getting out again proved ungainly. The Executive fixed that, allowing me to simply sit and swivel my legs to get in, a much more graceful affair. Once inside, the comfortable Black on Carrera Red leather seats provided an excellent seating space, and I could have legitimately traveled several hours in the back. Back on a plane leaving the event, I longed for the legroom found in the back of this car. There are plenty of great features in the back, including a new overhead flip down lighted vanity mirror, optional sun shades on both the side windows and the rear window. The center console houses two 12v auxiliary power supplies, and a 110v outlet to keep your laptop and cell phones charged. While Porsche probably wants me to talk about the back seat some more, as that's where all of the changes have been made and R&D dollars have been spent, I just can't get over how good the front seat is. This car is as close as I will ever get to piloting a guided missile. When you want it to be, it can be a great car for putting around town, creeping from stoplight to stoplight, as it is just as comfortable at low speeds as any other car. When you get open air, be it on a wide expanse of highway, or a beautiful mountainside with lots of twisty corners ahead, just plant your right foot for as long as you dare. Keep the throttle planted until you see the grim reaper on your tail, then hit the brake pedal. With this car, you can do just that, as the PCCB carbon brakes are absolutely stellar. Hauling a two-ton plus car down from speed in a few bats of an eyelash, the giant yellow calipers and carbon ceramic semi-floating rotors do their job. They say that top-fuel dragster pilots have to have surgery on their eye sockets every few years to keep them from popping out under deceleration. I imagine the same to be true of PCCB ownership. One feature Porsche was keen to mention regarding the Panamera lineup, but this car in particular, was its connectivity to cell phones. For those with phones with sim-cards you simply unplug the card from the phone and insert it into the dash of the car. from that point the car becomes your cell phone, and apparently the Panamera's antenna is superior to others. For phones without sim-cards, the car can still be connected via bluetooth. Another neat feature of this car was the cordless telephone handset available in the front or the rear of the car. This allows you to call and receive calls from the Porsche handset, though with many states outlawing drivers from talking on hands devices, it may be best kept to passengers. Another feature Porsche was proud of was the heat and sound insulated glass. As mentioned in the E-Hybrid review, this little bit of tech makes the car as silent as a library. Evidently, the process adds a transparent layer of pvc plastic between the two panes of standard glass. When fitted, the glass helps keep outside sounds out, but the car has been engineered to maintain the same level of exhaust noise whether you have this option or not. The only downside I could find involved the rear wing deployment; when the spoiler extends at 50 miles per hour, the electric motor is clearly audible, and for the first couple of times it happened, I was almost startled. This Panamera Turbo Executive was literally everything anyone could want in a car, but then it would be, wouldn't it? As the "Executive" suggests in the name, this car wouldn't be quite the same without some optional equipment, and let me tell you, Porsche built this car to the hilt. With nearly $60,000 dollars in options, there aren't many check boxes that Porsche didn't tick when they built this model. Showcasing many bespoke options available through Porsche Exclusive, this car even had the air vent slats trimmed in leather (a $2500 option). With more than a new Porsche Macan worth of options, this $221,075 Panamera is a little difficult to swallow, but definitely worth it if you can.